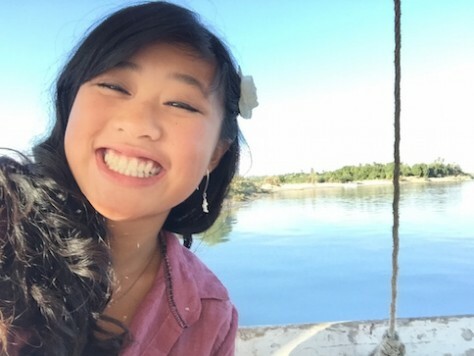 Olivia sat cross-legged on a large stripped cushion that covered the entire deck of the felucca sailboat. She was crying and holding the drawings and gifts she had just received from all of us for her 19th birthday. We thoroughly enjoyed the 2 nights felucca ride down the river Nile. Joani drew a series of 8 stick figure scenes of the fun moments she had with Olivia, such as doing hair or talking about their ideal dates. Nathan gave a 3-D drawing of him and Olivia writing the scores for Olivia’s favorite piano piece, Eternity. 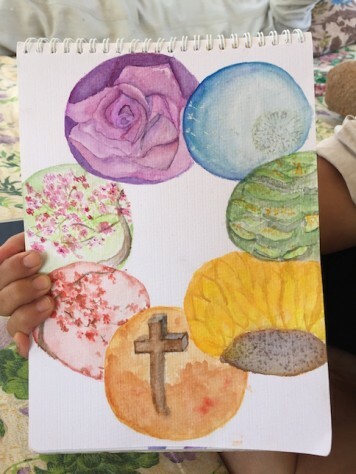 Mom painted 7 rainbow colored circular paintings of cross (her foundation & identity), sunflower (seeds of blessings), rice terrace (abundance of resources), dandelion (seeds of hope), rose (fragrance of Christ), spring (resurrection of Christ), and autumn (fire of Holy Spirit) each representing Annie’s different blessings for Olivia. 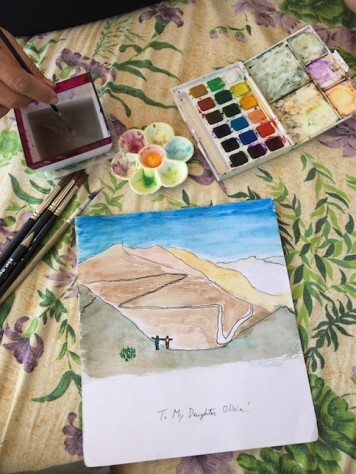 I painted a scene of our hike down the peak of the Annapurna Circuit during which we shared deeply, such as what things make you feel special or our favorite childhood memories. One of the birthday activity was to draw a memory of us with Olivia to give to her. Annie drew 7 circular paintings for Olivia representing the 7 colors of the rainbow. I drew a memory of Olivia and I hiking down from the high pass of the Annapurna circuit trail. Besides the drawings, we also gave her gifts as best as we could, given that we were traveling. Because Olivia likes to receive personal letters, Nathan and I both gave Olivia long letters. Nathan decorated his letter by burning the edges to make it look unique while I wrote the letter on a colorful paper painted by Annie. 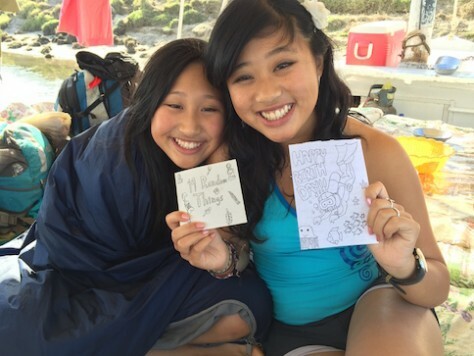 Joani’s gift was quite unique — she gave Olivia 19 coupons to use, one for each year of her birthday. Of the 19 coupons, 2 coupons were “buy any stationary” cards, 5 coupons were “Joani to be in good mood” cards, 3 coupons were “do anything for you” cards, 3 coupons were “get anything” cards, 3 coupons were “free dates” cards, and 3 coupons were “watch anything with me” cards! Joani gave Olivia 19 coupons and a card as gifts. We were sailing on the felucca on the Nile. We were right at half-way point of our one month trip in Egypt. Our first impression of Egypt was that it is like the India of the Middle East, crowded, chaotic, and taxing due to bargaining for everything. 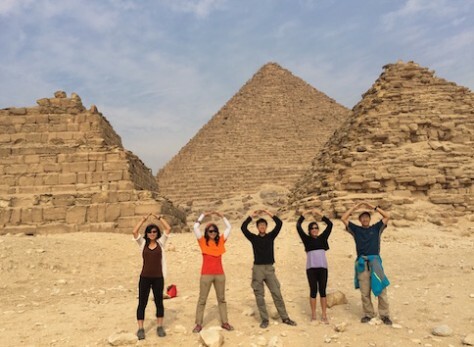 For the first 7 days, we did “workaway” (work for free room & board) at the Pyramid Loft Homestay literally right next to the only remaining 7 ancient wonder of the world – the Pyramids of Giza. Every day we got to live right next to these 5000 year old structures that the children had dreamed to see ever since they had their first history class. It was surreal. Everyday we worked few hours cleaning the floor and bathroom and then we had the afternoons off to visit the Cairo Museum, Coptic Church, and of course the Pyramids of Giza. Here at one of the wonder of the world! After Cairo, we took a night train to Aswan in south Egypt. There we stayed at an Nubian village on the Elephanti Island in the middle of the Nile River where ships from Africa and from lower Egypt exchange goods and elephant tusks. The sunset on top of the Tombs of the Nobles at Aswan was one of the most beautiful one I had seen. 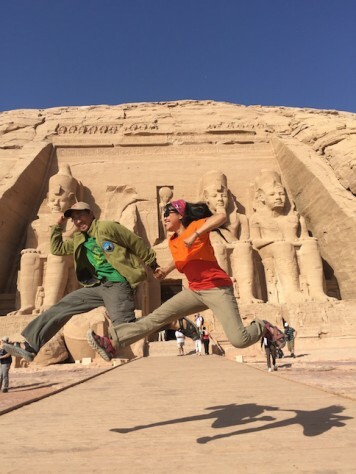 We also took an early morning tour south to the border of Sudan 250 kilometers away where we gazed in awe at the Abu Simbel Temple carved into the sandstone cliff built by Rames II to honor himself! Abu Simbel Temple, next to the Sudan border, was one of the best preserved temple built by Ramses II to honor himself. It was on the Elephanti Island where we celebrated Thanksgiving Day in Egypt. The children were all so excited because celebrating Thanksgiving was a reminder of home while away in exotic lands. Olivia was especially looking forward to making it special because she was born 19 years ago on Thanksgiving Day. Although her birthday does not fall on Thanksgiving every year, In our minds, Thanksgiving is always linked with Olivia’s birthday. After coming back from Abu Simbel, we went shopping for our Thanksgiving meal at the local supermarket. Instead of turkey, we bought two whole chicken as substitutes. Instead of stuffing, we made mash potatoes. We bought mayonnaise for the salad. Instead of children using their own money to buy snacks, I paid for 4-5 bags of Doritos and Lays Potatoes Chips and even bought a whole tub of Nestle’s ice cream and soda to make ice cream float! 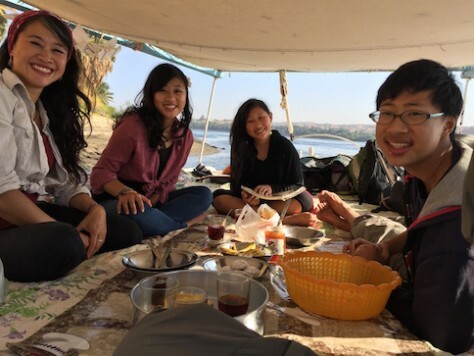 We celebrated Thanksgiving in Aswan with two chicken, mash potatoes, and ice cream! Everyone helped to make the Thanksgiving meal, except for me because I was having a fever. One peeled the potatoes, one cut the vegetables, and Annie fried the chicken and made the gravy. It was a feast. “We have too much food. I am stuffed. I told you not to buy so many potatoes,” I said. “American Thanksgiving is suppose to have leftovers!” Olivia emphasized. “Don’t forget we still have a whole tub of ice cream that we have to finish tonight,” Nathan added. 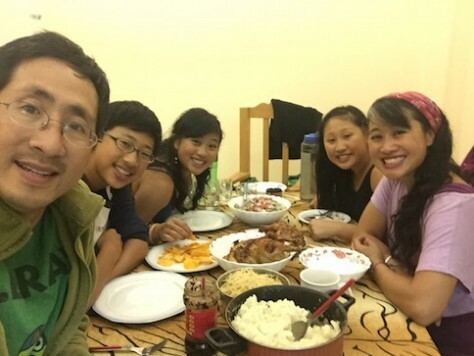 Our Thanksgiving feast was humble but abundant for us long term backpackers. “Do you know that none of my friends are having Thanksgiving with their families? I am the only one who is celebrating Thanksgiving with my own family. They are all away from home in colleges now. I am thankful that I get to,” Olivia shared with gladness but also sadness knowing that next year she will be away. “Can we fly Olivia back to China for Thanksgiving next year?” Annie pleaded. “I don’t think so but we can FaceTime and you can watch us eat!” I half joked. “That’s mean! …Will you guys Skype me for a whole hour next Thanksgiving or are you guys just going to Skype for 5 minutes and said, ’The chicken is ready, we got to go. Bye.’” Olivia said sadly as if it already had occurred. “Seriously, now that we are all full, let’s share what else we are thankful for.” I moderated this sharing time to make sure we have enough time to watch Fresh Off the Boat later. For our Thanksgiving chicken, we ate up everything except for the breast. “I have a lot to be thankful for. I am thankful that on the trip I get to sleep 7 to 9 hours everyday. And that is more than I got at home and that is a lot more than what I will get in college. So this is the most sleep I am going to get for the next decade!” Olivia shared first. “Sometimes we forgot that we are seeing things 4000 to 5000 years old,” I added realizing how incredibly well preserved these archeological sites have been. 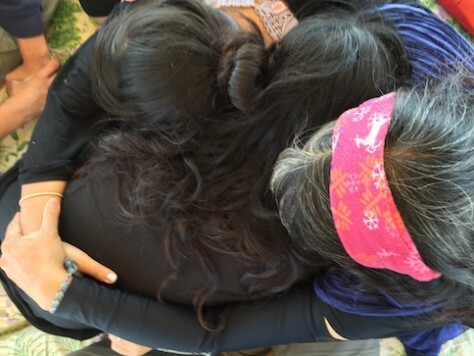 “For me, I am thankful Zoe seems to be better,” Joani shared. “Hearing you read this reminded me of the wall relief carving of the pharaoh on his horse chariot in Abu Simbel Temple,” I reflected. “After seeing all these tombs and temples, I realized how great, sophisticated, and smart Egypt was and what it meant to defeat Egypt. To walk out of Egypt is like ‘wheeewww”. There isn’t even a comparison. It’s like the biggest kingdom then and you just got defeated by slaves.” Olivia contemplated thinking about all the things we have seen in Egypt. We went around several more rounds to share each of our thanksgivings and to pray for each other. 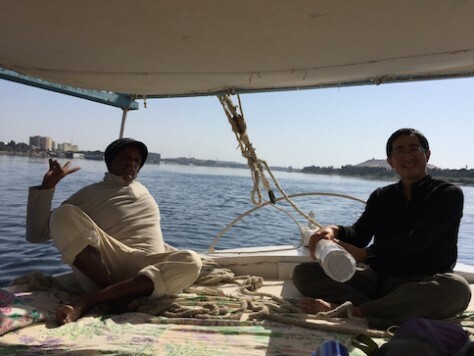 Ali and Mizo were Nubians who took us on this unforgettable 2 nights cruise. 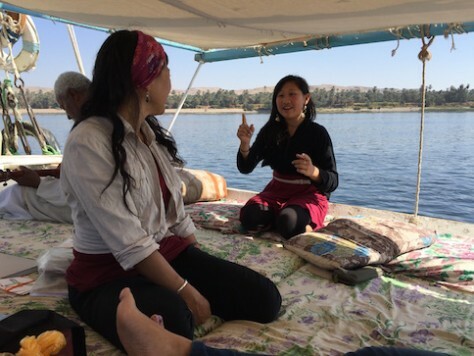 The next day, we embarked on our long anticipated felucca boat trip on the famous Nile River. 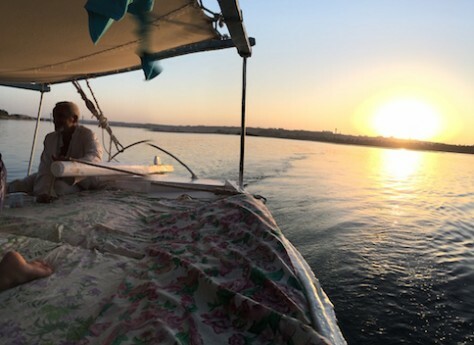 I was very excited to sleep 2 nights along the Nile on a traditional Egyptian sailboat that was used since the ancient days of the pharaohs. 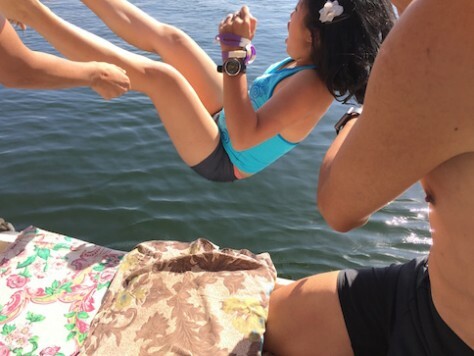 Strangely, Olivia was not so sure if she wanted to spend her 19th birthday on the boat. “There is no bathroom on the boat but we can dock along the shore anytime. It will be alright. Don’t worry,” I replied trying to cheer her up. Joani on the other hand was very excited about Olivia’s birthday. She has always been excited about birthdays, including other people’s birthday because on birthdays we will make the effort to make it special and to have lots of activities throughout the day. 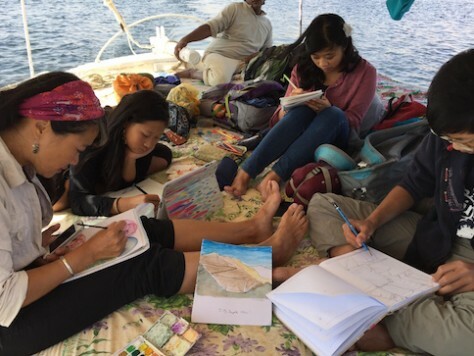 Joani relaxed on the desk of the felucca sailboat with the Elephanti island in the background.. When we got on the boat in the morning, we were all pleasantly surprised. Instead of the usual wooden benches along the sides of the sailboat, it was converted into a flat deck entirely covered with nice cushions. It was like a gigantic sofa bed with sails floating on water! We felt like royalties from the past, lying on the cushions, sipping Egyptian tea, and watching the river banks of the Nile passing by. Ali was the boat captain and Mizo was the assistant skipper. They are both Nubians, who have black skin and curly hair like those from Sudan. Ali had studied language in the university and spoke English very well. He was talkative and humorous, which added a lot of liveliness to our trip. 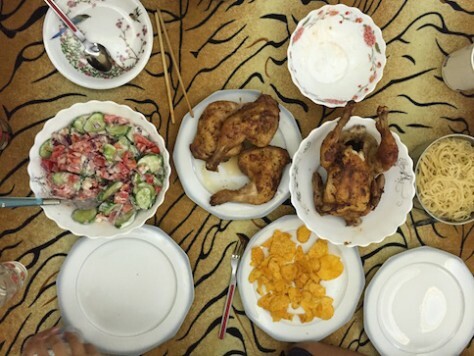 Ali and Mizo took turn to cook delicious Egyptian meals with meat course, bread, vegetables, and fruit. Ali also gave us arabic tea constantly throughout the day. 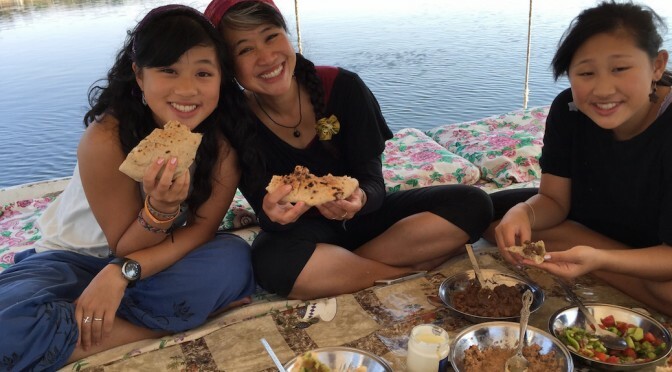 The taste, variety, and quantity of the food exceeded our expectation, especially as backpackers. We were jumping for joy! Sailing the felucca on my own was one of my most enjoyable moment. 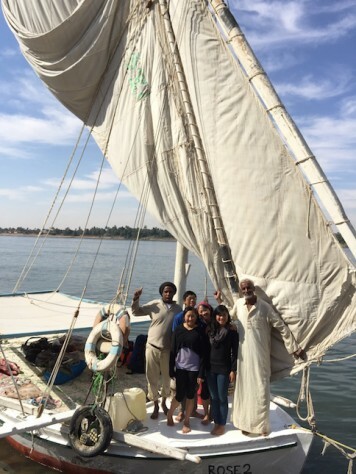 Having learned sailing while I was studying in Stanford, I eagerly asked Mizo to let me sail the felucca. Since we were sailing against the wind, the progress down the Nile river was slow as we zig zag back and forth across the river. There was a sense of accomplishment whenever the sail caught the wind fully and Mizo did not have to adjust the rudder as he sat next to me. As tourism was down 90 percent since the Arab Spring Revolution, we were the only felucca on the Nile and I felt I own the whole river. As I sailed and watched the sunset, my heart was fluttering with joy and thanksgiving to God for this unexpected gift. The sun glowed in orange as it set on Nile river. “Wake me up when you get up in the morning, dad,” Joani whispered into my ear. “To put up the birthday banner for Olivia,” Joani answered my puzzled look. 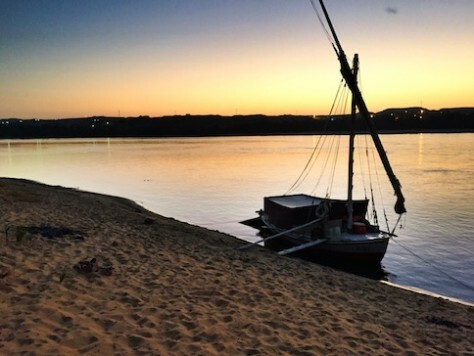 I woke up the next day around twilight and was rewarded with a beautiful sunrise sky over the Nile River. After waking up Joani, we tied the “Happy Birthday” banner across the frame of the boat and watched as Olivia woke up from her sleep. The morning twilight across the Nile river was glorious. “Happy 19th Birthday!” we all shouted together. Ali and Mizo also joined in the congratulations. Following Olivia’s birthday wish, I took photos of her climbing on top of the mast of the felucca. Next to the white sail and with the blue sky in the back, she looked very happy. 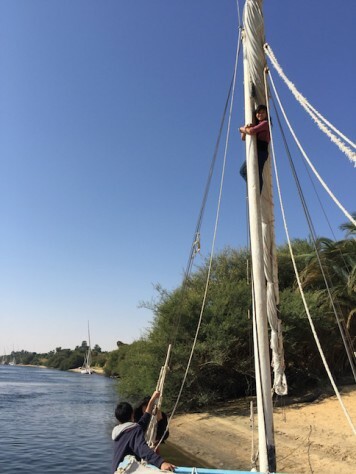 One of Olivia’s birthday wish was to climb up to the top of the felucca mast! 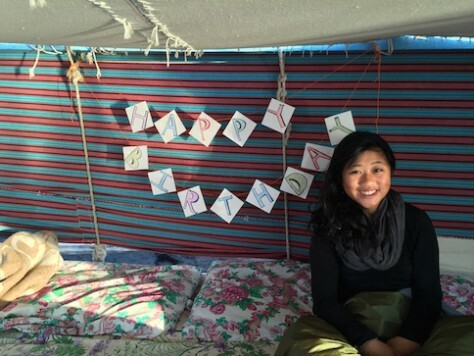 Olivia woke up to a birthday banner surprise on the felucca. After breakfast, we started with sharing 19 favorite memories we have with Olivia during our trip so far. Then we each sat down and painted and drew one memory with Olivia on paper since Olivia always wanted us to draw what we see instead of just taking photos. Next, we played charades. We each wrote on pieces of paper things that reminded us of Olivia as a teenager since this will be her last year as a teen. Then each person took turn to act out the content for others to guess. It was a fun time as we acted out things such as “going to MSG”, “acting in Sound of Music”, “going to prom”, etc. We played charade guessing phrases related to Olivia as a teenager. 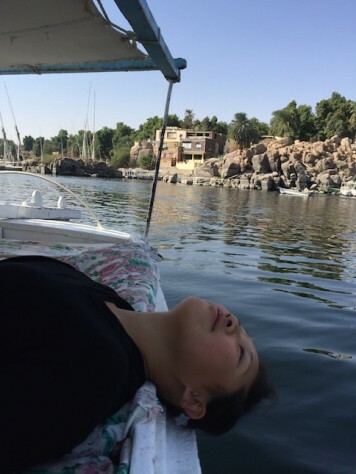 As the sun reached its apex, Ali docked the boat on an uninhabited island in the middle of the Nile for us to swim. Following our family birthday tradition, we threw Olivia into the water as her birthday baptism, then we all swam along the current. The water was clean, clear, and the bottom was sandy. We couldn’t believe we were swimming in the legendary Nile. Throwing the birthday person into the water became our yearly family tradition. 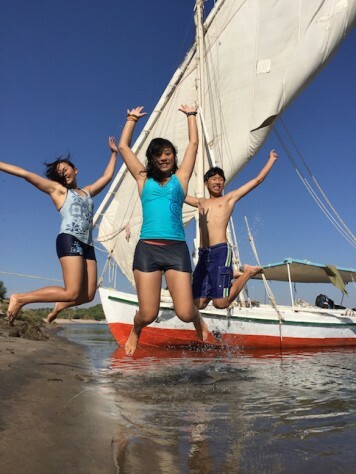 On the felucca, we often stop by the shore for quick swims. 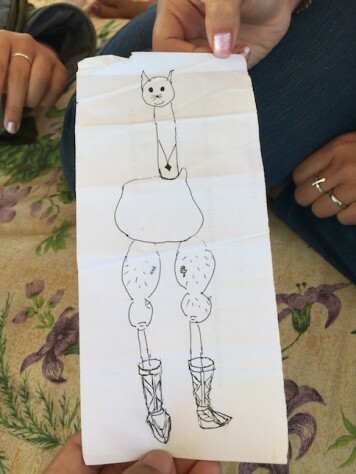 Joani, who spent several hours to research into birthday games, led a drawing game where we each drew different body parts from head to feet without seeing what others had drawn. After putting the pieces together, we ended up many funny looking drawings of “animals” that gave us many minutes of laughters. Joani led a game where we each draw a different part of an animal without seeing what the others drew. After giving Olivia our gifts, cards, and drawings, Olivia began to sob while reading them. “Why are you crying,” I asked Olivia as I came over to give her a long comforting hug. Also, part of our family tradition introduced by Olivia, we spent few minutes praying and listening to God for words of blessings to impart to Olivia. “Family and community are important to you. God promises that wherever you go, you will be blessed with gift of love that comes from the community you anchor and worship in,” Annie shared. “What about you, Olivia. Did you hear from God?” I asked Olivia. We prayed and blessed Olivia with words from God. We ended the time of sharing with us surrounding Olivia and praying for her what we heard from God as we laid hands on her. “Let’s have a party tonight!” Ali, the boat captain, announced with his usual contagious laughter. 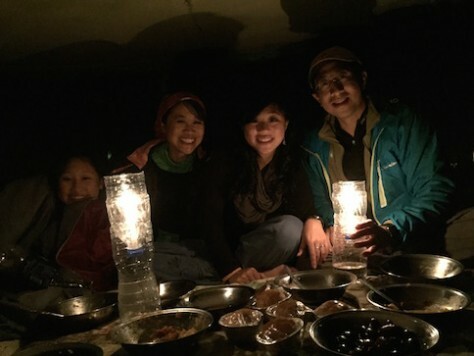 Ali and Mizo cooked us a special birthday dinner with candle lights on the boat! After a great meal of beef shashlik for dinner, we picked dried palm leaves from the fields and made a bonfire by the river bank. Mizo played the drum while Ali sang Nubian songs in arabic. Joani also took out the ukulele and we also sang ‘happy birthday’ to Olivia again as well as Christian campfire songs that we can think of. 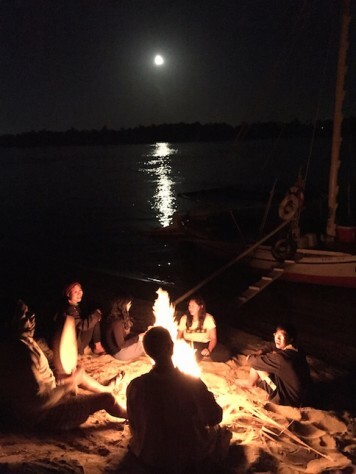 Singing and drumming at the shore of the Nile next to the bonfire and with the full moon on the sky was a great end to a great birthday. What an end for what unforgettable days of celebrating Thanksgiving and birthday on the River Nile.